The Maya Calendar was the center of Maya life and one of their greatest cultural achievements. The Maya Calendar's ancestral knowledge guided the Maya's existence from the moment of their birth and there was little that escaped its influence. 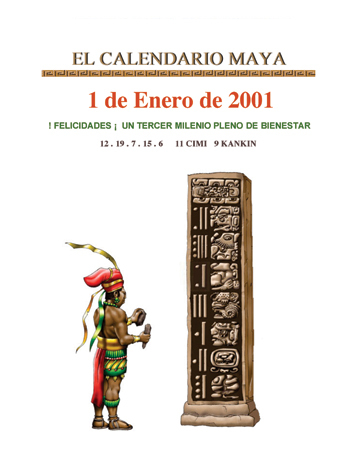 The Maya Calendar made by the Maya World Studies Center in Merida, Yucatan, Mexico follows a centuries old tradition. This Maya Calendar website is developing with the intent of providing a greater view of Maya culture; being that the Maya world was centered on their calendar, we think this name is more than appropriate for the Maya World Studies Center website. Click on the photo above or on the text link below to enter and enjoy, make sure you bookmark this site. Remember to return soon for new information is constantly added. We are grateful for your comments and suggestions, please Email us.